Daya’s hiking stick lay on the counter and we crowded around it like physicians over a patient. The plastic piece connecting two sections had cracked apart in a jagged line that left the bottom section free to slide apart with each step. The old man behind the counter spun the broken pieces between his fingers until they fit together again then frowned. Daya and I frown. I’d been hoping to try JB Weld since my dad is always telling me it will fix anything. Broken kayak seat, JB Weld. Appliance repair, JB Weld. Cracked chair, JB Weld. I figured that if we tried it, it would either work or I’d get to harass my dad, but it’s hard to find in unfamiliar stores. The man behind the counter waved his hand at the wall of adhesives and shook his head. Too weak, he said. He leaned over and inspected the broken piece, then disappeared for a moment, returning with a box of clamps, a screwdriver, and a pair of pliers. We all stared at our patient for a moment, then dove in, speaking Spanish, testing and prodding and trying things until we had a clamp over the broken plastic, screwed tight. We held the stick up and slammed it down few times. The clamp held then came free. We frowned. More Spanish, more ideas. Back to the table and six hands over the counter twisting, turning, and holding. Clamp again, this time tighter and wrapped with wire. Two good slams. Nothing budged. He looked at the wire closely, inspecting the work, nodded, clipped the wire ends and tied them off with surgical precision. A craftsman’s smile broke his face. A duct tape bandage later and the work was done. We all cheered. Daya’s pole had a chance to make it. “To Santiago,” he said, grinning. 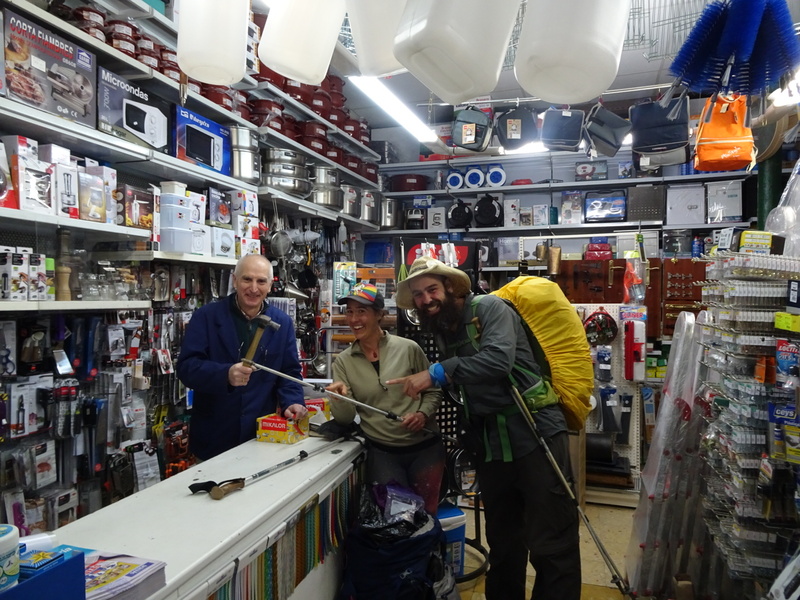 We had been there fifteen minutes working on the pole, crowding the small shop with our backpacks, mangling Spanish grammar and mispronouncing words, but the pole was working again. “How much is it?” Daya asked. Daya tried to hand him five Euros, but he shook his head. We would never return to his hardware shop. We would never come back to buy tools or cans of paint. We would never tell our neighbors he is a good man. But the price of the clamp was sixty cents and he wouldn’t accept a cent more. He took her euro, returned her change with a smile, and shook our hands. Love this story…love this photo…love the man’s attitude and good wishes! Buen Camino! 60 cents for a life lesson and a memory of a lifetime. I love it. Superb picture. Also, great looking paella pan on that shelf! So good to know there are still people like this in our world. Thanks. I’ve never met a person in a hardware store that was not kind and helpful. (I’m sue there are exceptions.) Hardware stores attract people who enjoy helping people. Another great story. Namaste.